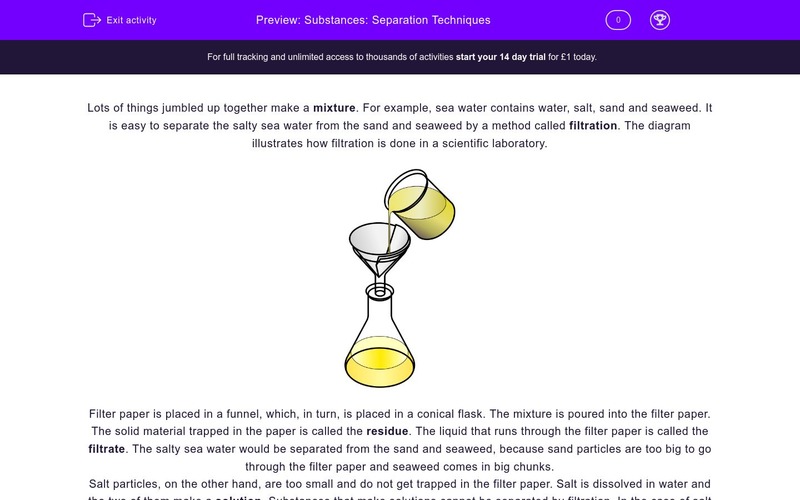 In this worksheet, students can have an overview of the various techniques used to separate mixtures and solutions. Lots of things jumbled up together make a mixture. For example, sea water contains water, salt, sand and seaweed. It is easy to separate the salty sea water from the sand and seaweed by a method called filtration. The diagram illustrates how filtration is done in a scientific laboratory. 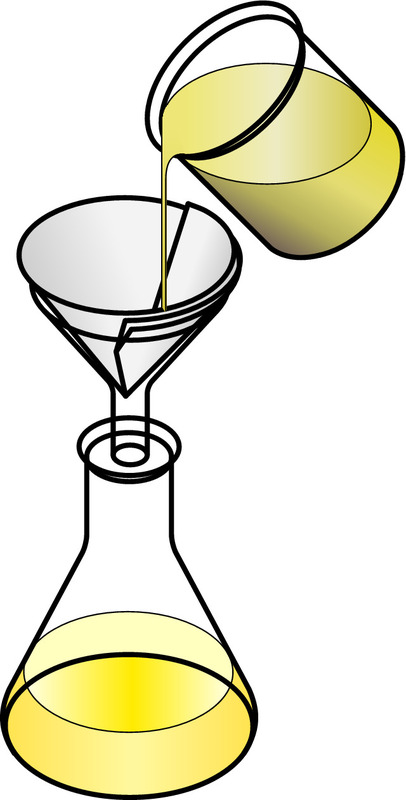 Filter paper is placed in a funnel, which, in turn, is placed in a conical flask. The mixture is poured into the filter paper. The solid material trapped in the paper is called the residue. The liquid that runs through the filter paper is called the filtrate. The salty sea water would be separated from the sand and seaweed, because sand particles are too big to go through the filter paper and seaweed comes in big chunks. Salt particles, on the other hand, are too small and do not get trapped in the filter paper. Salt is dissolved in water and the two of them make a solution. Substances that make solutions cannot be separated by filtration. In the case of salt and water, salt on its own can only be obtained, if the water is left to evaporate or heated, so it can evaporate faster. Distillation is another technique used to separate solvents from solutes, i.e. liquids from solids dissolved in them. For example, water can be separated from ink particles, as water particles evaporate when they reach their boiling point. They rise and enter a cooled tube, so they condense, which means they become liquid again and the pure water runs into a beaker. See the diagram below for the whole set of apparatus, which is called a still. There is another separation technique called chromatography. This is described in a separate worksheet. Name an example of a mixture you have learned about in this worksheet. Name a technique that could separate salty sea water from sea weed and sand. How do we call the solid material that is trapped in the filter paper? What do we call the liquid that goes through the filter paper? Why are sand particles trapped in the filter paper? They fit through the filter paper holes. Salt can be separated from water, if the water is left to ____________. Name a technique that uses evaporation and condensation to separate solvents from solutes. What will happen if you heat sea water? The water will evaporate more slowly. The water will evaporate faster. How is the whole set of apparatus for distillation called? You have some inky water. Choose the best method to separate the water from the ink. An example of a mixture is sea water. It contains salt, seaweed and sand. Filtration is used to separate sea water from sea weed and sand. The solid material that is trapped in the filter paper is called residue. The liquid that goes through the filter paper is called filtrate. Sand particles are too big and do not fit through the filter paper holes. Salt can be obtained from a solution of salt and water, if the water is left to evaporate. Distillation uses evaporation and condensation to separate solvents from solutes. If you heat sea water, the water will evaporate faster. 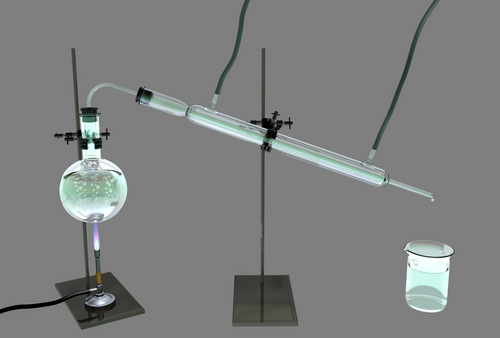 The whole set of apparatus for distillation is called a still. Distillation is the best method to separate water from ink, as the ink is dissolved in the water.